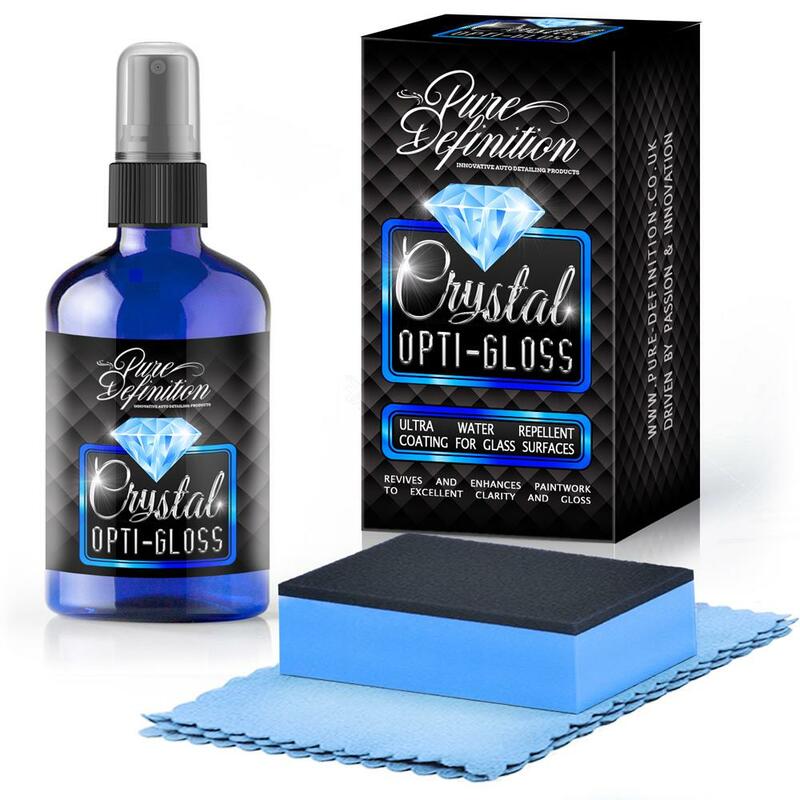 Crystal Opti-Shield+ is developed using our innovative surface technology which is engineered with the very latest cutting-edge ingredients and technological advancements. This is our most durable coatings available, offering optimum protection. 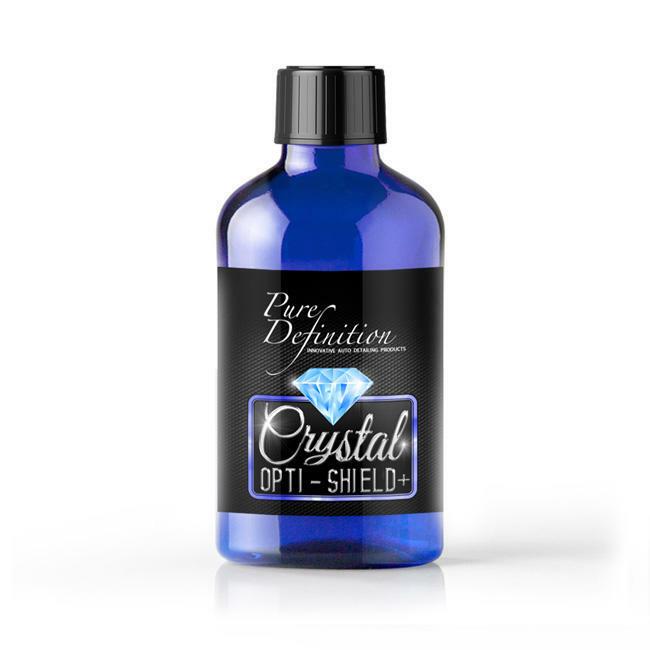 Crystal Opti-Shield+ has been engineered to cure naturally without the need for any expensive equipment or a special facility. Applying Crystal Opti-Shield+ guarantees an optimum high gloss hydrophobic chemical resistant coating which will bond to surfaces such as paintwork for over 5 years. the coating will crystallise transforming to create a rock hard protective coating which shields and locks in the original paintwork finish, creating an increased scratch/swirl resistant surface. 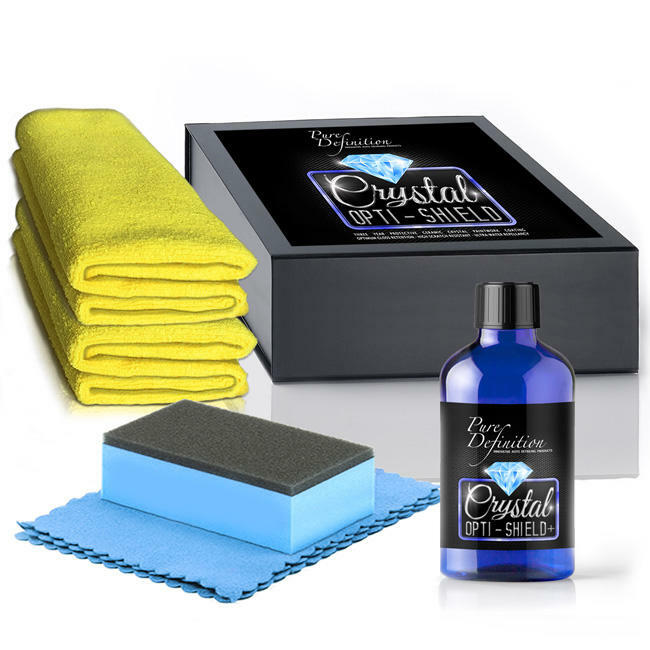 crystal opti-shield+ also makes it difficult for dirt and grime to adhere to the surface of the protective coating. The innovative coating is highly engineered to adapt and withstand all potential weather extremes, protecting the paintwork from fading and degrading in the blazing summer sun and in the freezing and winter. additionally, The constant changes in environmental conditions result in the vehicle panels expanding and shrinking year round. The chemical structure of Crystal Opti-Shield+ instinctively adapts to the surrounding environmental conditions without causing any damage or cracking to the coating. To further enrich gloss and magnify the ultra-hydrophobic water repellent (water beading) characteristics of Crystal Opti-Shield+ then apply a layer of Crystal Opti-Gloss every 6 months. 1. Before applying polish away all paintwork imperfections if required. remove all dirt and grime from the surface. ensure the surface is completely dry. Wipe down the surface with a degreaser such as coating and residue remover. (if applying multiple layers this step is only required for the first layer). 2. 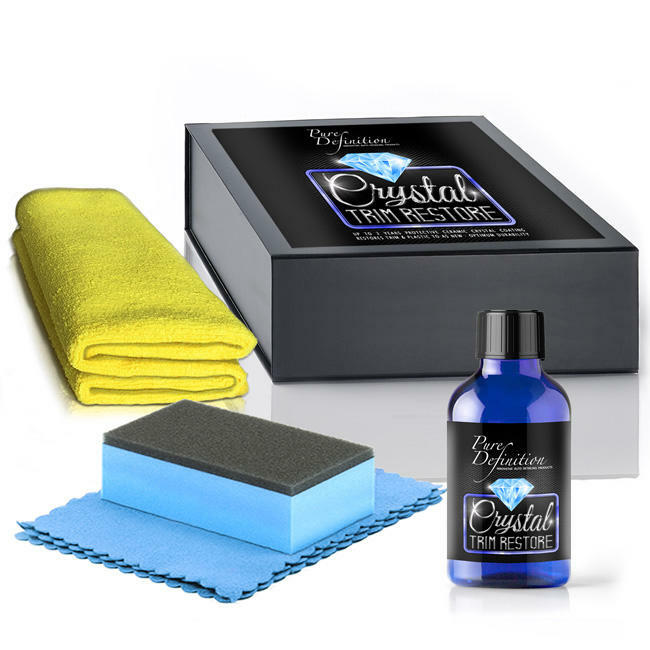 Wrap the blue cloth around the applicator pad and drop between 5 and 10 drops of Crystal Opti-Shield+ onto the cloth provided. 3. apply to a small area at a time (for instance the left side of the bonnet) and Apply in overlapping strokes. Remove each area before moving onto another section. 4. If the surface temperature of the vehicle is 5-15°C wait two minutes before removing with a microfibre cloth. if between 15-25°C remove after one minute, above 25°C remove immediately. never apply in direct sunlight and in temperatures over 40°C. 5. Multiple layers can be applied, let each layer cure for 2 hours before reapplying. 6. do not get moisture or dust on the surface for 2 hours during the curing period. after this the surface is dry and the vehicle can be driven. Crystal Opti-shield+ will fully crystallise and harden over 7 days. for the best results try to avoid washing or applying any strong chemicals to the vehicle during the first 7 days. 7. 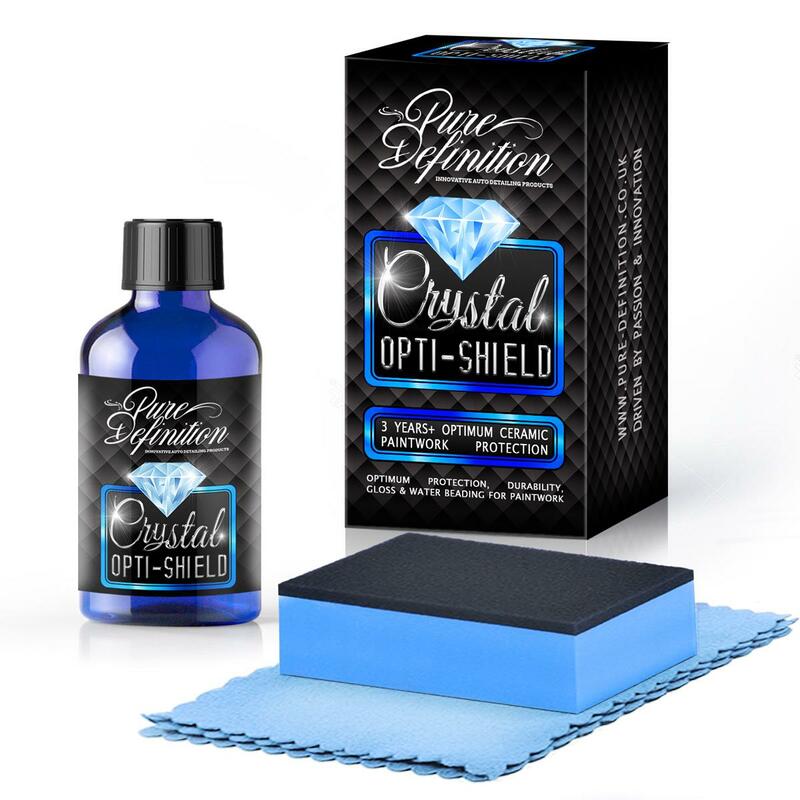 To further enrich gloss and magnify the Hydrophobic (water beading) characteristics of Crystal Opti-shield+ apply a layer of Crystal Opti-Gloss after the 2 hours curing period and then every 6 months. *once the coating has been applied it can only be removed via polishing. *do not apply in direct sunlight. *use in high temperatures may cause uneven application and difficult removal.